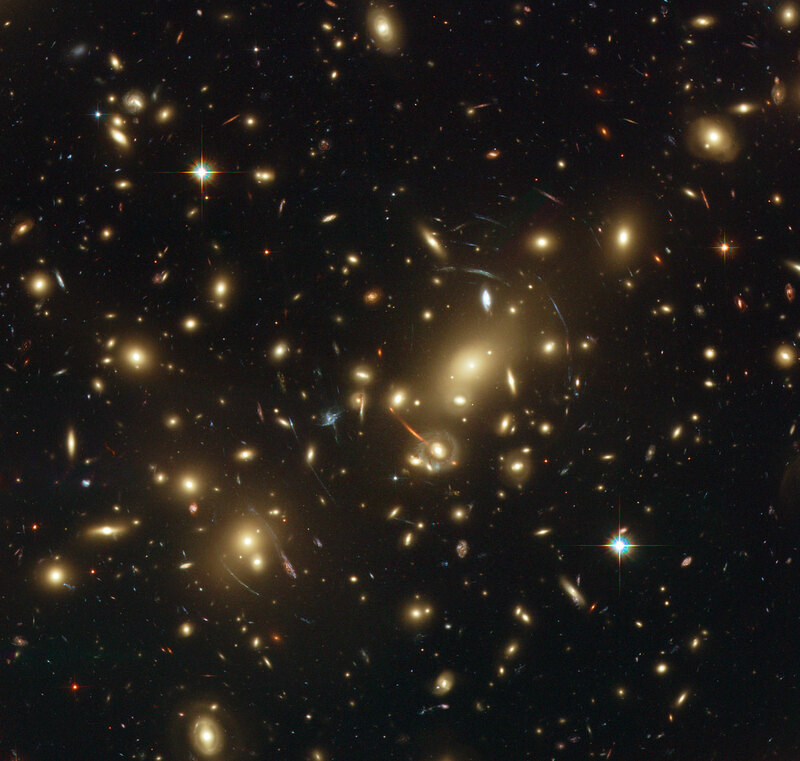 New Hubble Space Telescope observations of six spectacular galaxy clusters acting as gravitational lenses have given significant insights into the early stages of the Universe. Scientists have found the largest sample of very distant galaxies seen to date: ten promising candidates thought to lie at a distance of 13 billion light-years (~redshift 7.5). 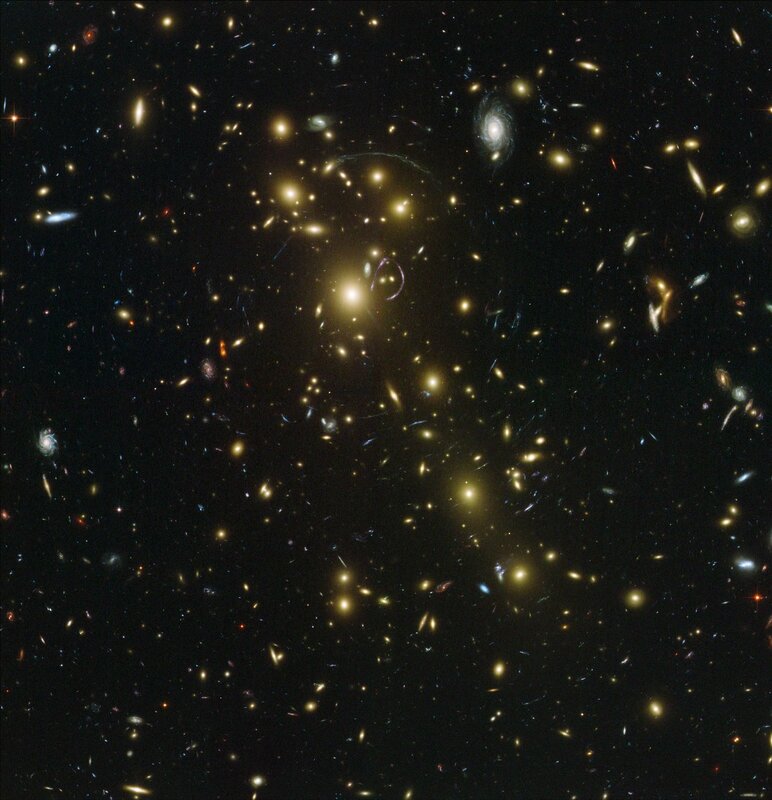 By using the gravitational magnification from six massive lensing galaxy clusters, the NASA/ESA Hubble Space Telescope has provided scientists with the largest sample of very distant galaxies seen to date. 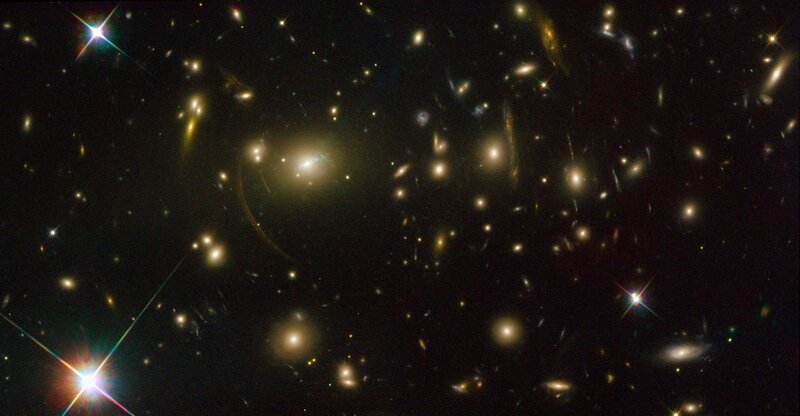 Some of the newly found magnified objects are dimmer than the faintest ones seen in the legendary Hubble Ultra Deep Field, which is usually considered the deepest image of the Universe. 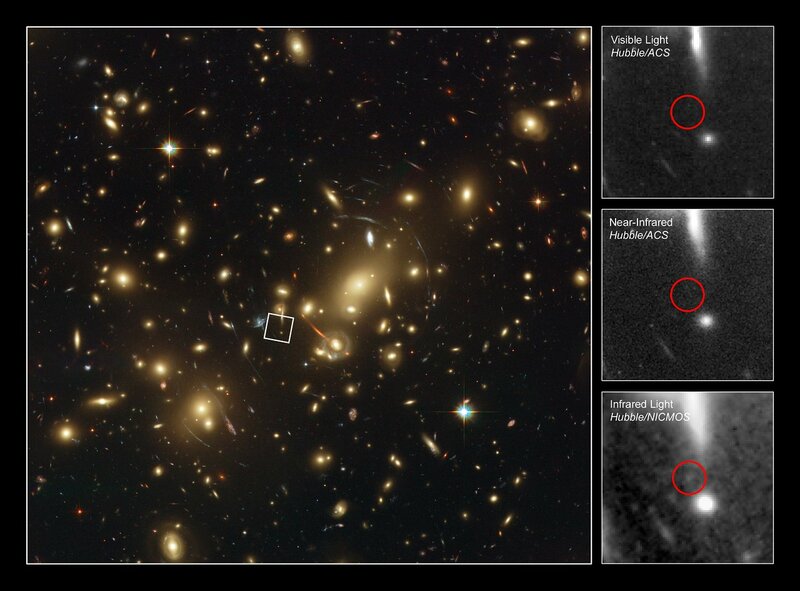 By combining both visible and near-infrared observations from Hubble's Advanced Camera for Surveys (ACS) and Near Infrared Camera and Multi-Object Spectrometer (NICMOS), scientists searched for galaxies that are only visible in near-infrared light. They uncovered 10 candidates believed to lie about 13 billion light-years away (a redshift of approximately 7.5), which means that the light gathered was emitted by the stars when the Universe was still very young - a mere 700 million years old. "These candidates could well explain one of the big puzzles plaguing astronomy today. We know that the Universe was reionised within the first 5-600 million years after the Big Bang, but we don't know if the ionising energy came from a smaller number of big galaxies or a more plentiful population of tiny ones", said Johan Richard, from the California Institute of Technology. The relatively high number of redshift 7.5 galaxies claimed in this survey suggests that most of the ionising energy was produced by dim and abundant galaxies rather than large, scarce ones. 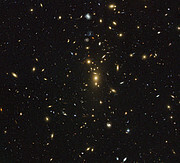 "The challenge for astronomers is that galaxies beyond a distance of 13 billion light-years (past a redshift of 7) are exceedingly faint and are only visible in the near-infrared -- just at the limit of what Hubble can observe" explained Jean-Paul Kneib from the Laboratoire d'Astrophysique de Marseille. This new result was only made possible with some cosmic assistance in the form of gravitational lensing that magnified the light from the distant galaxies enough for Hubble to detect them. A firm confirmation of their distance was beyond even the capabilities of the 10-meter Keck telescope and must await powerful future ground-based telescopes. First observationally confirmed in 1979, gravitational lenses were predicted by Albert Einstein's theory of General Relativity, a theory that allows astronomers to calculate the path of starlight as it moves through curved space-time. 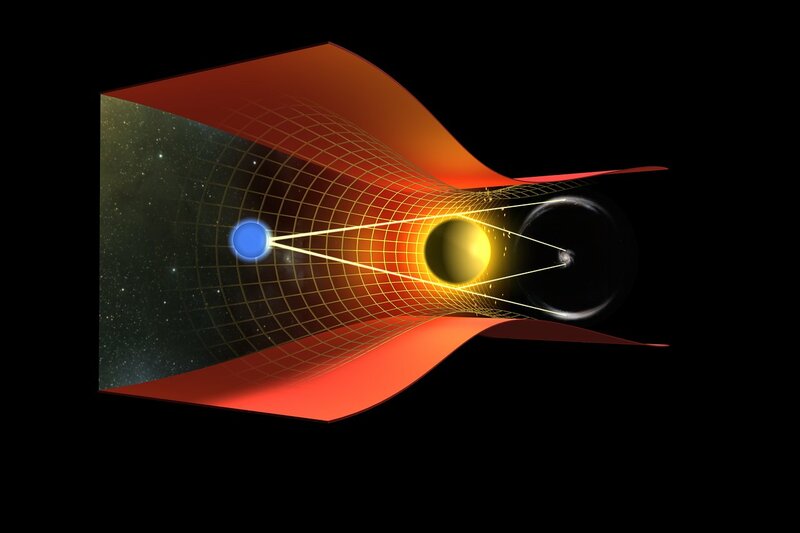 According to the theory, the bending of light is brought about by the presence of matter in the Universe, which causes the fabric of space-time to warp and curve. 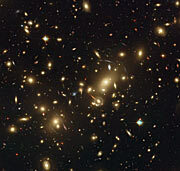 Gravitational lensing is the result of this warping of spacetime and is mainly detected around very massive galaxy clusters. Due to the gravitational effect of both the cluster's observable matter and hidden dark matter, the light is bent around the cluster. 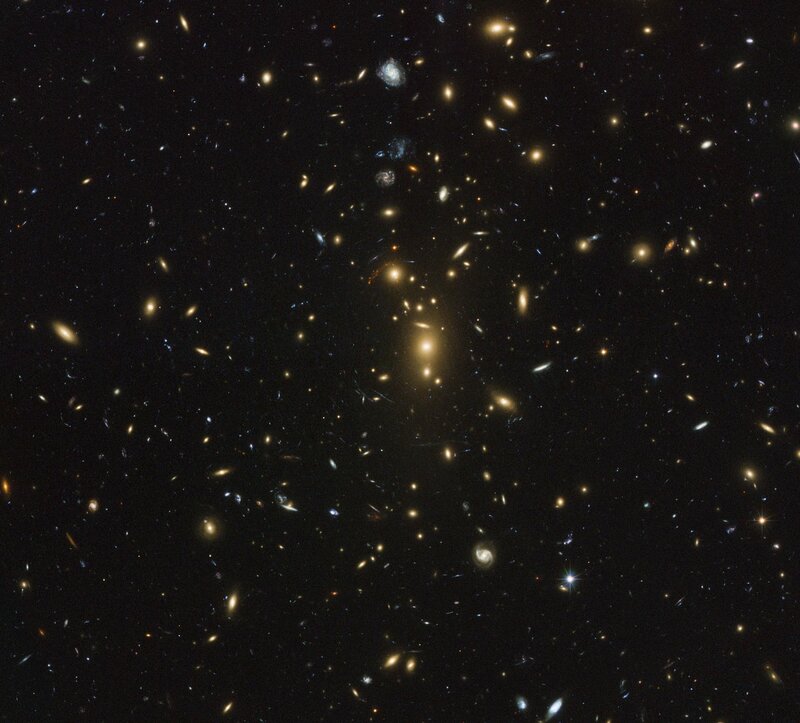 This bending of light allows the clusters in certain places to act as natural gravitational telescopes that give the light of faint and faraway objects a boost. Where Earth-bound telescopes fail to detect such faint and distant objects due to the blurring introduced by the Earth's atmosphere, a combination of Hubble's location in space and the magnification of the gravitation lenses provides astronomers with a birds-eye view of these elusive objects. 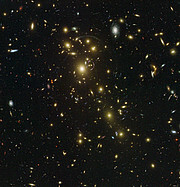 This technique has already been used numerous times by Hubble and has helped astronomers to find and study many of the most distant known galaxies.